Models, drawings and their respective parameters are captured, so rules can be applied to produce new variants from a specification. Specifications can be run (using the forms designed in DriveWorks) from the DriveWorks Task Pane inside SOLIDWORKS. The SOLIDWORKS outputs resulting from a completed specification can be generated. A DriveWorks 3D File can be saved from an assembly or part so it can be presented in the 3D Preview control. Appearance parameters of the DriveWorks 3D File are captured using DriveWorks 3D Workshop. 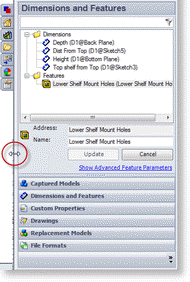 Open SOLIDWORKS and from the Menu bar click Tools> Add-ins. From the Add-ins dialog scroll down to the section Other Add-ins. Select the required DriveWorks Add-ins from the list. 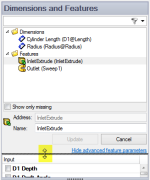 Active Add-in - Makes the Add-in active in the current session of SOLIDWORKS. Start Up - Will load the Add-in on each start up of SOLIDWORKS. DriveWorks <version number> - Activates the DriveWorks tab in the SOLIDWORKS Task Pane. DriveWorks 3D Export - allows SOLIDWORKS models to be saved in the DriveWorks 3D Format. Once the DriveWorks add-in is loaded in SOLIDWORKS all commands for capturing, specifying and generating are accessible from the DriveWorks tab of the SOLIDWORKS Task Pane. Open SOLIDWORKS and right click in the Menu bar. From the right click Command Manager menu select Task Pane. The Task Pane will appear on the right hand side of the graphics window. The DriveWorks logo is displayed on the DriveWorks tab (see the image above). Select this to bring the tab to the front and begin using DriveWorks. At least one DriveWorks Pro module (Administrator, User, Autopilot or Live) is required to be licensed on the machine you are using SOLIDWORKS on. All of DriveWorks' capture capabilities are contained inside of the DriveWorks Pro tab in the SOLIDWORKS Task Pane. If you've got the SOLIDWORKS Task Pane turned off, it is easily re-enabled by right-clicking the SOLIDWORKS Menu Bar, and choosing "Task Pane" from the drop down menu which appears. A Capture Explorer containing buttons relevant to the file you have open. The buttons that are visible within the Capture Explorer depend on whether you have a part, assembly, or drawing open, and whether the part or assembly is Captured. Open Group - will launch the wizard, the drop down provides links to open recently used groups. New Group - will launch the wizard. Save - saves changed information to the currently open group. Refresh model and group data - refreshes the information in the Capture Explorer if the model changes. Run - will run a new specification in the task pane. Help - launches the help file. Action links appear in a few different places in DriveWorks, they typically provide a quick way of launching relevant functionality (for example, the Project Wizard if no project is open), or launch the help file and navigate to a topic relevant to the section you are working with. The initial Action Link will require a group to be opened. If no groups have been opened before the message will display Click here to open a group. If a group has previously been opened the message will display Click here to open the last group. The Task Pane ignores the DriveWorks Administrator setting "Automatically open last used group". The buttons in the capture explorer are used to tell DriveWorks what custom properties, dimensions, features, and more, are to be controlled by DriveWorks (this process is called Capture). After you've created or opened a group, you can use the Explorer to capture new assemblies, parts, and drawings, or work with already-captured ones. The DriveWorks Task Pane runs the full height of the SOLIDWORKS graphics window. The task pane and elements within it can be resized to suit your preferences as below. Place the mouse pointer on the left hand side of the task pane until the horizontal double arrow appears. Left click and hold the mouse and drag the window until the desired width is achieved. The buttons at the bottom of the Capture Explorer can be set to run horizontally along the bottom of the task pane as below. Move the mouse above the first button until the double arrow appears. Left click and drag the buttons down. 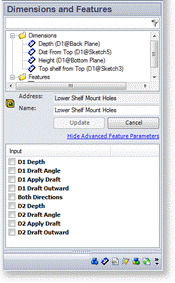 Specifications can be made directly from the SOLIDWORKS Task Pane. For more information please see New Specification. 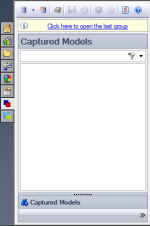 Models and drawings that are queued for generation can be generated from the DriveWorks tab of the SOLIDWORKS Task Pane. For more information please see Model Generation. A DriveWorks 3D File allows 3D content to be shown over the internet regardless of which browser is being used. Browsers that support WebGL do not require any 3rd party plugins to be installed on the client machine. Browsers that do not support WebGL or if the client machine's graphic card does not support 3D a message to install Microsoft Silverlight will be shown. A DriveWorks 3D File has the extension .Drive3D. This file is created from inside SOLIDWORKS. In SOLIDWORKS open the SOLIDWORKS Assembly or Part the Drive 3D file is to be created from. Click File, Save As from the SOLIDWORKS menu. To facilitate the manipulation of the DriveWorks 3D file DriveWorks have created a brand new product for DriveWorks 9 - DriveWorks 3D Workshop. DriveWorks 3D Workshop allows DriveWorks 3D Files to be modified for viewing in a web browser. Capturing is the process of telling DriveWorks what documents, models and drawings you want to automate, and what features in those models and drawings are going to change.